A few years ago I witnessed something on twitter that struck a cord with me, I’m not sure why but the project fascinated me. I was watching a hashtag, #chainletter — every time it popped up there was a new letter by some designer out there in the world. I’m not sure how the project started, or who but eventually it would die off maybe getting to the letter E. Then a day or so later someone else would start a new chain and the cycle continued. I’m not fully sure why this project intrigued me as much as it did but it really stuck with me. And it wasn’t until this last year that I remembered the project. I wanted to do my own version of it, but I knew the project would fizzle out and die eventually. So back in February of last year, specifically February 8th. I sat in Bennu Coffee shop in Austin, Texas thinking about this project. To be 100% transparent I was a little burnt out from my 9–5 grind and I needed something to keep the creativity alive. I happened to be at Bennu that day due to starting a new group via some friends called “Side Hustle Sunday” — the idea was that we’d get together on Sunday’s and do random projects together or just work on our own projects and have someone to bounce an idea off. With a full stein of coffee and a blank page I started to think about what I wanted to do, not at first about this project. More about what I wanted to do every Sunday, a bunch of ideas came up but nothing felt right. I had a friend sitting next to me working on some card, she was practicing her hand lettering styles. That was the spark that made me remember the chain letter project I had seen on twitter. 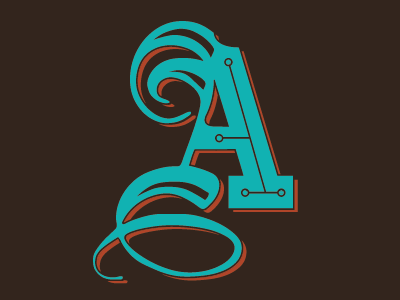 So I figured why not, I just started to draw my own letter, of course with a chain you start with the letter A.
I posted this mockup on Dribbble. I thought about doing an initial run of of drop caps, similar to what Jessica Hische did, but then I didn’t have all the letters. Plus I wasn’t the badass letter she was. I got to talking to my friend at the coffee shop about the letter, she seem to really think it was cool. So I wanted to figure out what I wanted to do with it, how can I scale this into a full print? Do I have time to create each letter. Do I really want to create 25 more blackletter, script designs? I decided against most of the questions above, other then the notion of some kind of print. I knew this would look rad to print, but again I needed all the whole alphabet. 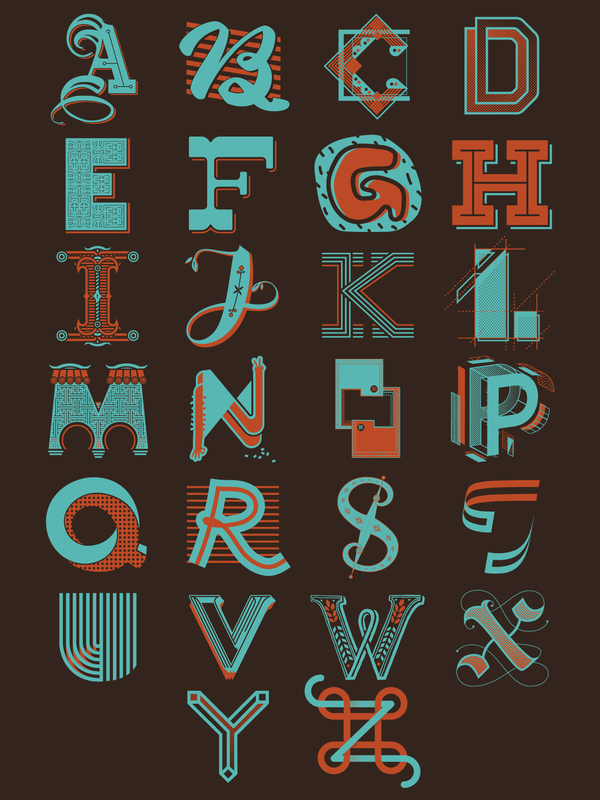 A few weeks prior, I had picked up this Jude Landry drop cap print, it was beautiful. I was like I wonder if I can merge this chain letter idea from Twitter and this amazing print concept together? I also really badly wanted to print on French Paper’s Hot Fudge, mostly because I liked to say Hot Fudge… Yes, I’m still 12. So I had a paper choice, I had some PMS colors selected, but I still needed to figure out the other letters. Being a designer, I’ve been fascinated with the Type Fight guys for a bit, I thought what they where doing was rad. So my initial thought was to see if I randomly emailed a designer from the internet and see if they’d be willing to design the B and then tag someone they knew and so on. However I quickly realized this may have the same fate as the twitter version. Instead of going directly to the industry to see if I could put this project in motion, I knew I worked with about 200+ designers at IBM Design. So I figured that would be the easiest place to start. I knew a lot of them, I had access to all their email address and part of the reason why I started this project was to have something creative outside of work; I figured some of my colleagues would want the same. The project had a few rules to it, I wanted people to tag someone they hadn’t directly worked with or didn’t know that well. They had to create one letter with the predetermined color palette and they had 48 hours to complete the letter before passing it to the next designer. In retrospect this was some lofty goals to be consistent with but I had to start some where. I started the chain off by tagging someone I had been around the summer prior but hadn’t really worked with / done a project with but I knew he (Stephen Nixon) was very into lettering and was up in the New York office so I knew it would get the print out of Austin for at least a letter. 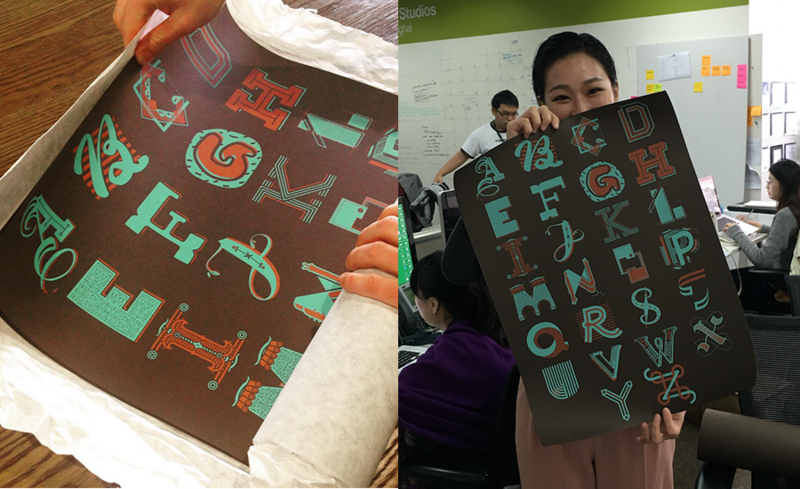 Stephen Nixon’s process from sketch, to building his letter via Glyphs App and to final letter. From there the project kind of took a life of it’s own, from Stephen it went to Grainne Kelly in Dublin, Ireland. It then landed back in the studio with Matthew C. Paul, jumped back out to another Austin Studio called the Mobile Innovation Lab, back to Austin, out of Austin, and back. All in all it the project took a lot longer then expected, mostly due to the project turned into a very large game of telephone. At one point the project got stuck in Shanghai, China for a few weeks, mostly due to how the project landed with them and also the excitement of the project. Eventually it headed back out on the road. 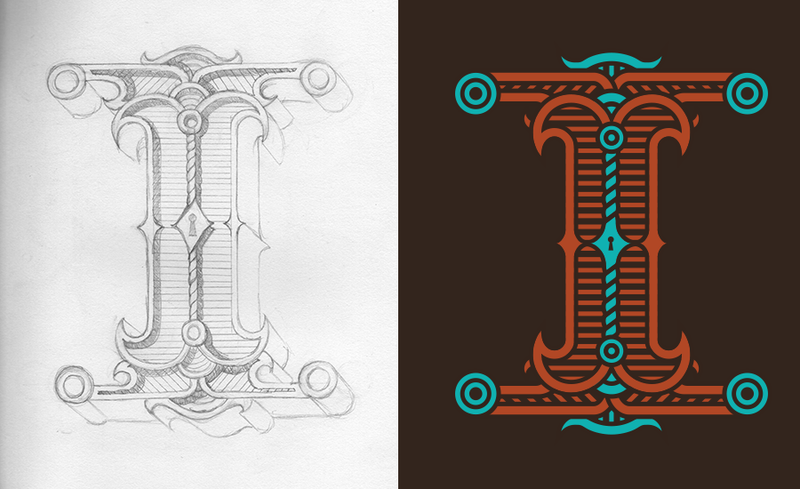 Stevie Johnston’s W from sketch to refinement to final letter. From the beginning of this project, the carrot to get each designer to complete their letter was that I personally was footing the bill to print a final poster. Each designer on the print was sent a poster for themselves and one for their respective studio to hang up. I think this could be the driving success as to why the print didn’t fizzle out during the process, everyone I think wanted to be apart of something bigger but also they wanted to see what the final print would look like. When I started this project, I wouldn’t had thought it would had gone the way it did, but there’s not much I would change now that it’s done and printed. But I couldn’t had done it with out the amazing designers who worked on their individual letter, and got multiple emails from me asking where their letter was and who they sent it on too. This project was also selected as a Project Passion self initiative typography piece for the 2016 show in Minnesota. The opening of the show is on Feb. 1st at Minnesota State University, Mankato. My name is Cam, I am a left-handed, one hand clapping, Gemini, multi-disciplined creative currently living in Austin, Texas. Views are my own, not my employers.